This drill is a modified version of one that I watch Kyle Wallack run. 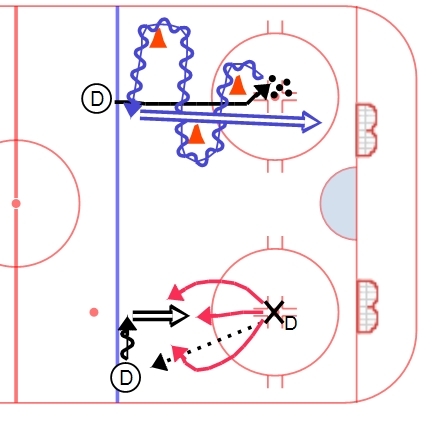 The drill starts with D on opposite blue lines and Forwards in two lines in the center of the blue line. F1 and F2 exchange a puck while F1 skates towards F2 (rapid fire bumps). F1 then mohawks out to the boards. Meanwhile, D1 and D2 have been exchanging a puck while D1 walks the blue line for a shot (1). D2 then places a puck for D1 near the top of the circle. D1 surrounds it and fires a quick up pass to F1. F1 skates in for a shot on net. D1 now follows the play up ice and recieves a pass from the opposite D line as they hit the blue line, catching and shooting in stride. 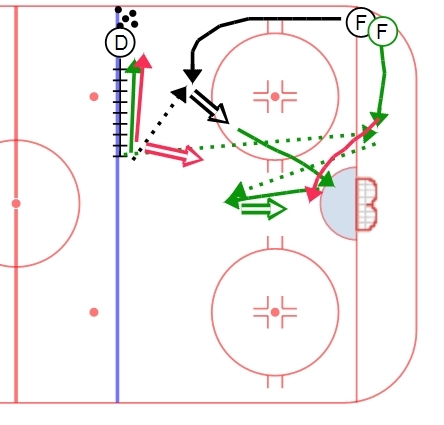 The drill then alternates sides, with F2 skating towards F1 line while bumping, etc. This drill could also be done full ice just using defenseman, as the drill primarily focuses on d skills (hence the title). A half ice skill drill today. The drill starts with a defenseman on the wall. D walks the blue line and hits a forward coming out of the corner on a high roll for a shot. The D then goes back to the blue line for a second puck. D again walks the blue line, this time hitting a second forward who has gone from the corner to the dot line on the goal line. The first forward has gone to the net and then pops for a pass from the goal line forward. The D then retrieves a third puck, walks the line and takes a shot through two men screening (pop forward stays high, goal line forward moves to the net front). D should focus on walking and moving the puck with their eyes up the entire time. All shots and passes should be made with eyes up ice. Forwards need to accelerate up the wall and through the shot. Pop should be with purposeful movement and a quick one-timer attempt. Two defensemen shooting drills this week. The first drill is on top, the second drill is on the bottom. Both drills are not quite drawn to scale in order to better illustrate the diagrams. The first drill is an agility skate. Place a pile of pucks at the dot, with three cones in the corresponding zig-zag pattern. The D skates the pattern always facing the net and with their eyes up the entire time (major point of emphasis). Forward skate to retrieve a puck, transition to backwards and skate around the inside cone, then the outside cone, then walk the line. The net should be positioned in a manner such that the shot has to come through the lane between the first two cones. This creates a shooting target for the D – they are not merely trying to put a puck on net, but get it through a certain area. The second drill on the bottom is a pure shooting drill. The goal is to get pucks through to the net and teach the D never to get their shots blocked. The shooter starts at the blue line. The blocker/passer starts at the faceoff dot. There are a number of progressions to this drill. In the first one, the shooter starts in line with the hash marks and facing the player who will pass the puck. The passer zips a pass out and then skates straight at the shooter, who has to get a shot on net without getting it blocked. The passer cannot go down to attempt to block the shot, merely skate straight at the shooter with stick out and shins in shooting lane. The shooter is allowed to take a step to either side in an attempt to get the shot through. The second and third variations start with more of an angle – the shooter starts on the wall or in the middle of the ice and the blocker/passer skates in an angling pattern to one side or the other attempting to influence the shooter to move/shoot in that direction. The shooter should always attempt to provide false information and a little movement to get the shot though to the net.